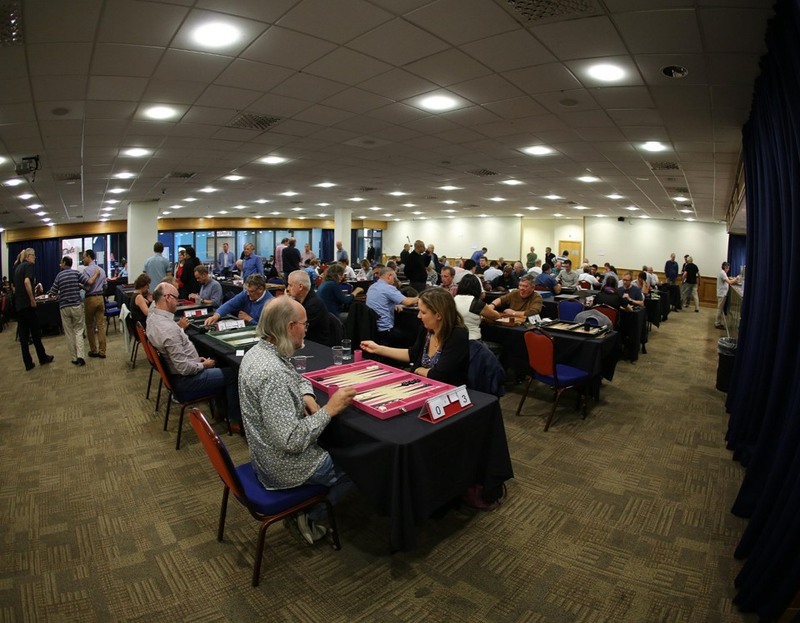 When the last dice had been rolled early on Sunday evening and players were either heading for home or converging on the Grosvenor Casino to eat, over £30,000 in prize money, 18 trophies and three Parker Backgammon Boards had been distributed to the winners. A total of nine matches were recorded and the XG files are available for download here. The main attraction on the Friday was the UK v Japan Team Challenge in which the three Japanese Giants were pitted against three top UK players. In the first phase of this battle, each team member played a 3-point match against every member of the opposing team. The result of this was 6-3 in Japan’s favour which translated to a 3-0 start in phase two: a 9-point fully-consulting match between the two teams. Japan were leading 7-2 when Team UK looked almost certain to pull two points back. However it was not to be: good rolling culminating in a 66 ended the match 9-2 to Japan. Five of the singles matches, plus the team consulting match, are in the downloadable zip above. Mochy’s video of the entire consulting final can be found here (Part One & Part Two). 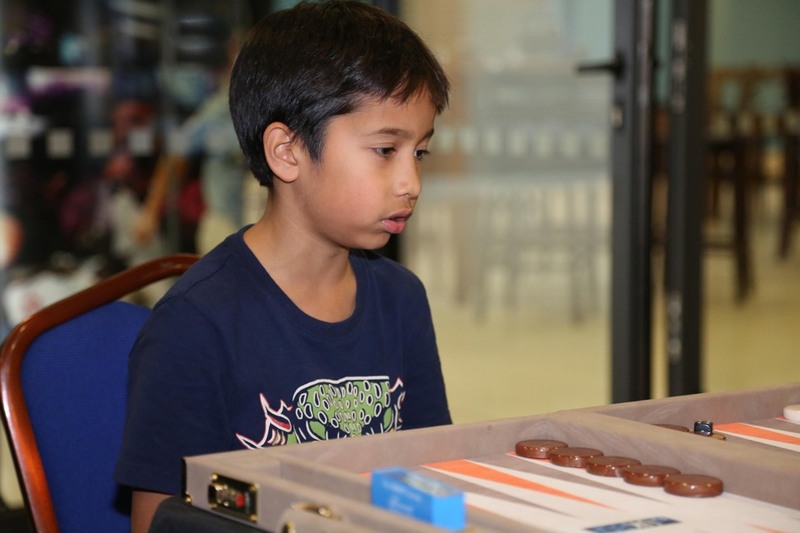 Twenty-one players took Mochy and Michy’s backgammon proficiency test – most on the Friday evening, plus a few stragglers on Saturday. The highest scorer, not only at the UK Open but in the world so far, was Tim Line with a staggering 42 correct answers out of 50! Akiko highlighting Tim Line’s test score! Saturday’s victor in the Beginners had to finish top in his round robin group of seven, playing 2-point matches with no cube. He then had to play a final against the top player from the other group of seven. Emerging from this with the loss of just a single match was 8-year-old David Broomfield. Already a ‘natural’, I believe that David could become a Backgammon Giant if he continues to play and enjoy the game as much as he does now. Sunday’s winner in the Beginners, with a lower entry of seven players, was Flavia Losniceriu. 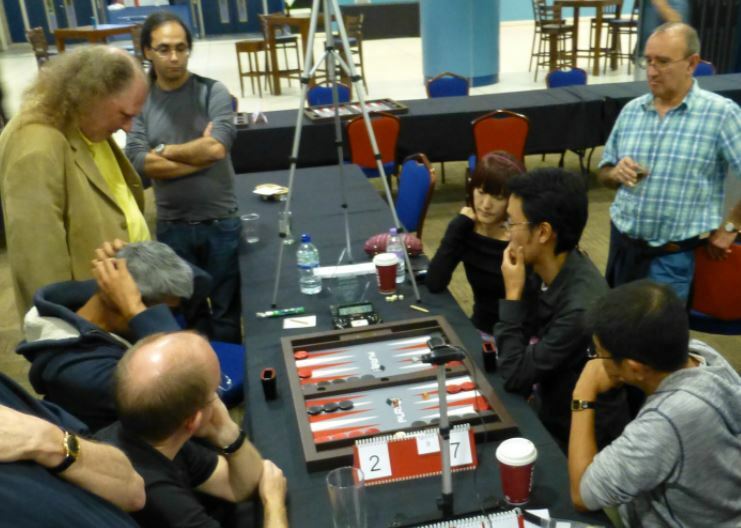 Both Beginner Champions received Parker Professional Roll-up boards, courtesy of Geoffrey Parker Games Ltd. 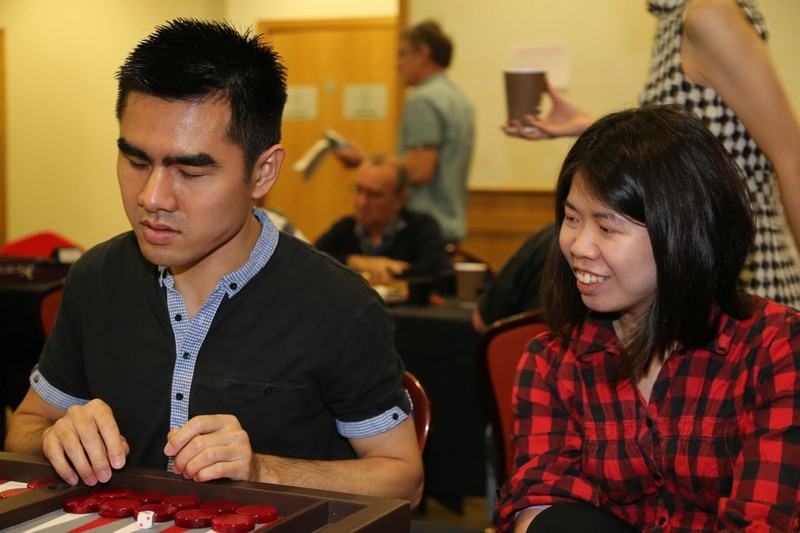 In one of the Intermediate semi-finals, Donna Sherred’s partner Mike Williams dutifully recorded the match whilst also calling the dice, and Donna’s moves, for her blind opponent Yan Kit Chan. Yan won after trailing 4-9 to 11, achieving a commendable sub-5 XG Performance Rating (PR) in the process. Yan’s final against Andreas Sophocleous was also recorded, by Graham Read (both matches are in the downloadable zip file above). This reached DMP with Yan winning the last game to take the UK Open Intermediate title. Congratulations Yan! 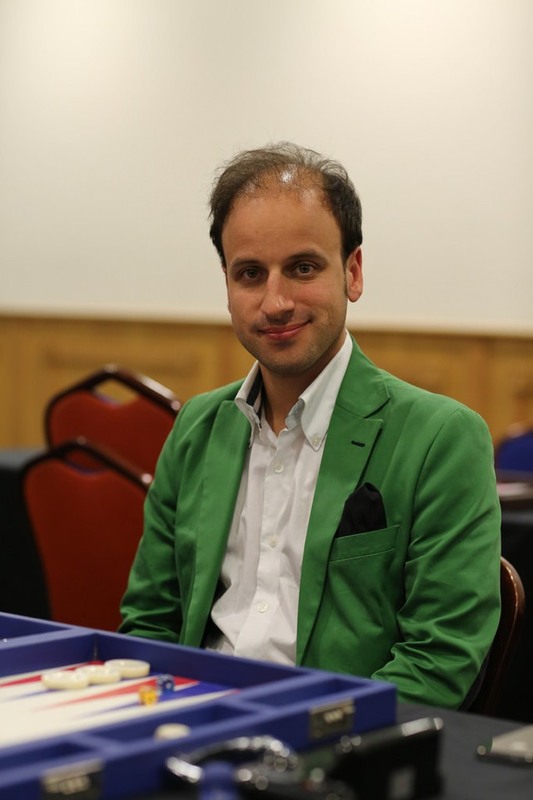 In the Championship Flight, Tariq Siddiqi went the furthest of all the British entrants, losing in the semi-final to Germany’s Martin Birkhahn. In the other semi, Irishman Dave “Cracker” MacNamara lost out to Jason Pack of the USA, currently residing in the UK. More may be written about positions from the final in due course. For now I will report that Jason emerged the UK Open Champion by the scoreline of 13-5 over Martin. In addition to the prize money and Champion’s trophy, Jason will receive a bespoke Parker backgammon board. Congratulations Jason and bad luck Martin! So what about the answer to the question in the first paragraph? Well, no decisions have yet been made regarding venue or date for the next UKBGF tournament, but I confidently predict that there will be a 2015 UK Open. Before that, plans are being made for the election of a new UKBGF committee. More on that in another post…. CHAMPIONSHIP (74): 1-Jason Pack (USA/UK), 2-Martin Birkhahn (Germany), 3/4-Dave “Cracker” MacNamara (Ireland) / Tariq Siddiqi (UK); Arena Cup: 1-Chris Hamilton Jeans (UK), 2-Ian Tarr (UK). INTERMEDIATE (51): 1-Yan Kit Chan (UK), 2-Andreas Sophocleous (UK), 3/4-Lee Gorton (UK) / Donna Sherred (UK); Arena Cup: 1-Alan Beckerson (UK), 2-Mike Murton (UK). SATURDAY BEGINNERS (14): 1-David Broomfield (UK). 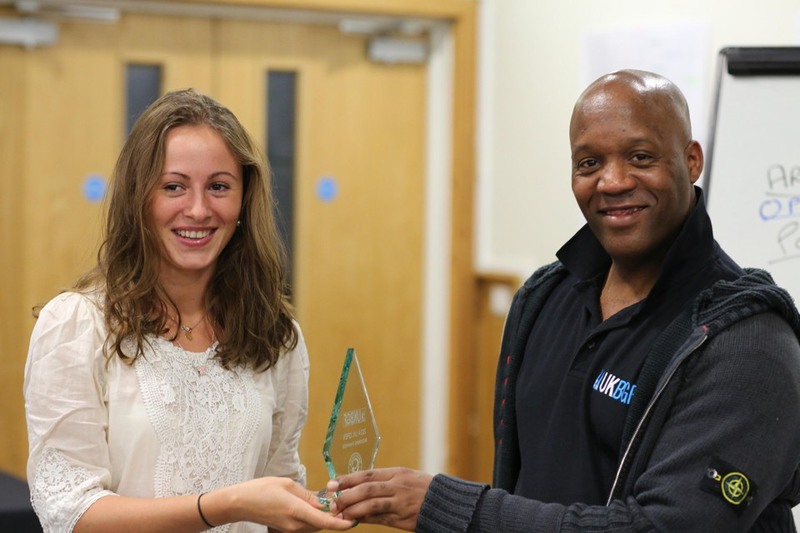 SUNDAY BEGINNERS (7): 1-Flavia Losniceriu (UK). WARM UP (70): 1-Mike Murton (UK), 2-Eric McAlpine (UK). £5 ONE-POINTER (128): 1-Chris Hamilton Jeans (UK), 2-Neil Young (UK). £1 ONE-POINTER (128): 1-Mike Barrett (UK), 2-Adam Stocks (UK). SUPER DOUBLES (8 teams): 1-Farzin Aarabi (Norway) & Shiva Tagizadeh (Norway), 2-Jon Barnes (UK) & Eric McAlpine (UK). DOUBLES (17 teams): 1-Cynthia Roberts (UK) & Ian Tarr (UK), 2-Steve Morris (UK) & Warner Solomon (UK). 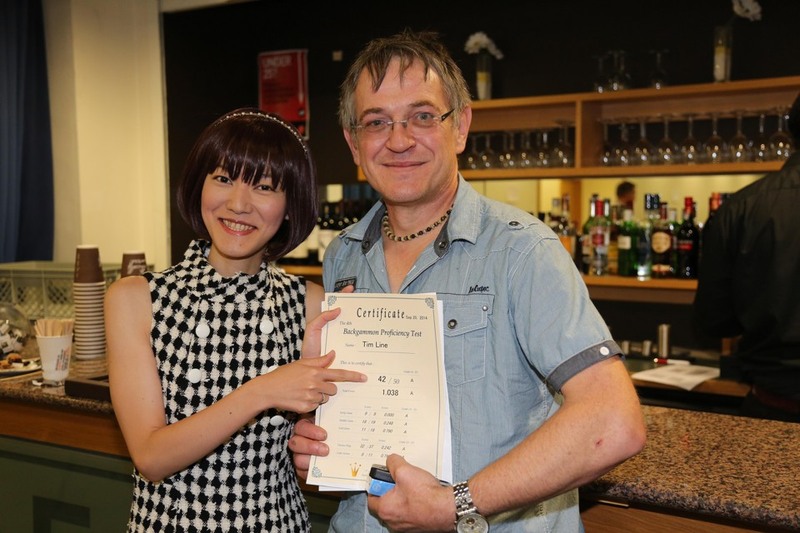 MOCHY/ MICHY BACKGAMMON PROFICIENCY TEST (21): 1-Tim Line (UK), scoring 42 out of 50! UK/JAPAN TEAM CHALLENGE: 1-Japan Team: Michihito Kageyama / Masayuki Mochizuki / Akiko Yazawa, 2-UK Team:Julian Fetterlein / Raj Jansari / Lawrence Powell. Photos (except the shot of the Team Event) courtesy of David Startin. Founder member of the UKBGF Interim Committee in 2013 and has served on the UKBGF Board since election in December 2014. Competitive backgammon player for over forty years. Can be reached at peter@ukbgf.com.